The Holiday season is here once again, but this year’s December brings an event that will most likely shape the way we operate in our world for decades to come. Of course, I’m referring to the upcoming 15th Conference of the Parties (COP 15) of United Nations Framework Convention on Climate Change (UNFCCC) in Copenhagen. As a run-up to COP 15, we attended the Autumn Conference, hosted by Statoil, which served as the Oslo launch of the International Energy Agency’s 2009 World Energy Outlook. We’ve included a brief report on the Autumn Conference and it’s focus on COP in Copenhagen. The IEA has put forward a “450 Scenario” that limits atmospheric climate gases to 450 parts per million once we reach 2030, as opposed to the more than 1,000 ppm projected in their “Reference Scenario” (which is, in essence, to carry on without change). The IEA proposal limits warming to 2° C – as opposed to the 6° rise projected for the Reference Scenario. Be sure to visit the IEA website (www.iea.org) to find out more and to order your own copy of the WEO. 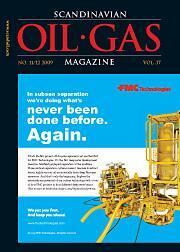 This edition also includes a close look at the Skarv development – BP Norge’s extensive project in the Norwegian Sea. Skarv has begun to take shape, and is now roughly half-way to commencement, so we decided it was time to take a look the project’s progress thus far as well as what’s left to do before production begins in late summer, 2011. We begin with an overview of the major contracts and milestones, and we have interviews with some of the key engineers overseeing the development. We also have a report that outlines Brazilian President Luiz Inácio Lula da Silva thoughts about the exploration and development – and above all, the economic opportunities – of the pre-salt area off the shores of his country. Not only is Brazil slated to reap untold benefits from oil wealth, the vast pre-salt fields should serve as a buffer to ease the world’s declining oil reserves. World-wide, the credit crunch has played havoc with investment in exploration and development, and we hear from EnergyFiles about how oil price and demand have played a part, making short-term predictions all too difficult. This in-depth look at market forces and activities, perhaps will provide some insight as we look to the new year. On the technical side, we look at GE Oil & Gas’ newest subsea offerings, the SVXT and DHXT – two subsea trees that have been re-designed from scratch. From Nobel Denton, we hear about new studies into the evaluation of deepwater mooring lines reliability. Also, we have a report on boiler inspection and maintenance from Wärtsilä Danmark. And this is just to mention a few of the articles in this issue.